If there's one thing urbanites complain about most, it's a yearning for more space. And while many of us pride ourselves in the art of minimalism, the one room that never ceases to lack capacity is, more often than not, the kitchen. IKEA is sympathetic to this affliction, and this month introduced SEKTION, a stylish new modular kitchen line that's not only tremendously pleasing to the eye, but specifically designed to provide storage upon storage, "drawers within drawers", and an insane level of organization customized to the cook's desire. We recently toured the Paramus, New Jersey showroom to give you an up-close look at these sustainable, swoon-worthy designs. Click through the gallery, and be prepared to drool. The highlight of SEKTION is its stackable soft-close drawer system, which discreetly stows everything from kitchen tools, linens, pots and pans, to recycling bins, in easy to pull-out “drawers within drawers” – so there’s no reaching, bending or crawling through cabinets to get at things. Even appliances like dishwashers blend in seamlessly with the rest of the design, clad with the same exterior facade as its neighboring drawers. The 15 inch-deep overhead cabinets are easy to access as well, opening “up” rather than “out,” thereby creating more reachable and organized space. The drawers and overhead cabinets are available in a myriad of size and material combinations, including bamboo and high gloss white, all of which can be virtually arranged at IKEA self-service digital kiosks before purchasing. SEKTION replaces the former kitchen collection, AKURUM, which was more self-service inclined and less customizable. With SEKTION, there’s more freedom to tailor the layout and style for your own personal use, and there’s a bit more assistance coming from IKEA kitchen experts and less of a ‘DIY‘ feel, though customers are still welcome to design their own kitchens. 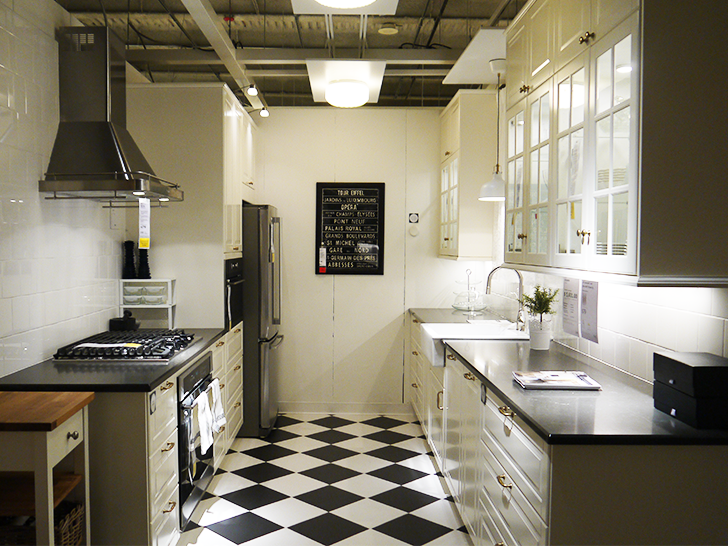 If desired, IKEA will plan, measure, order and install your entire kitchen right by your side. Everything in SEKTION is specifically measured out in whole numbers to perfectly fit with other IKEA collections, including a wide array of interior organizers to make items even easier to retrieve and organize. The overhead cabinets and drawers are also now equipped with integrated LED lighting, replete with remote control dimming and automated in-drawer lighting. Over the past few years, IKEA has made major sustainable efforts worldwide, including the installation of solar panels on all of IKEA’s stores and warehouses, use of ground source heat pumps, and a huge investment in wind farms, all with the aim of producing as much energy from their own renewable resources as they use by the year 2020. In fact, it was recently announced that last year IKEA sold $1.3 billion worth of sustainable products alone. The SEKTION kitchen collection is comprised of several eco-friendly features, including low-flow aerating faucets, energy-efficient appliances, bamboo drawers, 100% LED lighting, North American-made cabinetry, and quartz countertops in place of granite. While we can try every IKEA hack in the world, sometimes there’s no getting around a lack of cabinet, drawer and counter space. If this doesn’t inspire you to remodel your kitchen, we don’t know what will. IKEA developed the concept of SEKTION after extensively researching the top needs of people in today's modern kitchen, discovering that ease of use and functionality was most important. The 15 inch-deep overhead cabinets are easy to access as well, opening "up" rather than "out," thereby creating more reachable and organized space. The drawers and overhead cabinets are available in a myriad of size and material combinations, including bamboo and high gloss white, all of which can be virtually arranged at IKEA self-service digital kiosks before purchasing. The highlight of SEKTION is its stackable soft-close drawer system, which discreetly stows everything from kitchen tools, linens, pots and pans, to recycling bins, in easy to pull-out "drawers within drawers." There's no reaching, bending or crawling through cabinets to get at things. SEKTION replaces the former kitchen collection, AKURUM, which was more self-service inclined and less customizable. With SEKTION, there's more freedom to tailor the layout and style for your own personal use. The overhead cabinets and drawers are also now equipped with integrated LED lighting, replete with remote control dimming and automated in-drawer lighting. Even appliances like dishwashers blend in seamlessly with the rest of the design, clad with the same exterior facade as its neighboring drawers. With SEKTION there's a bit more assistance coming from IKEA kitchen experts and less of a 'DIY' feel, though customers are still welcome to design their own kitchens. If desired, IKEA will plan, measure, order and install your entire kitchen right by your side. The SEKTION kitchens are available in a wide of array of styles, from traditional, to modern and Scandinavian, with lots in between. Everything in SEKTION is specifically measured out in whole numbers to perfectly fit with other IKEA collections. The appliances are all designed for ease of use and accessibility. The styles will inspire you to discover a layout that works best for you. Many of the layout styles are envisioned for small, urban spaces, including this design that resembles a studio apartment. Over the past few years, IKEA has made major sustainable efforts worldwide, including the installation of solar panels on all of IKEA's stores and warehouses, use of ground source heat pumps, and a huge investment in wind farms, all with the aim of producing as much energy from their own renewable resources as they use by the year 2020. In fact, it was recently announced that last year IKEA sold $1.3 billion worth of sustainable products alone. The SEKTION kitchen collection is comprised of several eco-friendly features, including low-flow aerating faucets, energy-efficient appliances, bamboo drawers, 100% LED lighting, North American-made cabinetry, and quartz countertops in place of granite. A wide array of interior organizers are available to make items even easier to retrieve and organize.